"THEY come from real life. They come from the fives of people I know. They come from newspaper articles. They're all pretty real," remarked Greg Hollingshead, when asked about where his stories' characters are derived from. He continues: "I'm not very good at imagining, at least mine, quite unsatisfactory. Not nearly as interesting as what actually happens." 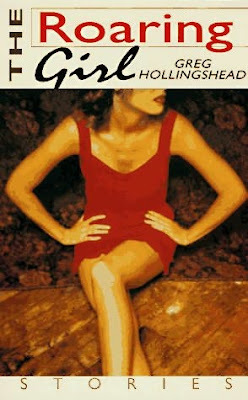 Hollingshead, 63, is the Toronto-born author behind the applauded Bedlam novel (2004) and the 1995 Governor General's Award for Fiction, The Roaring Girl (pictured right), and one of the recent inductees into the City of Edmonton Hall of Fame's Art & Culture branch. The induction ceremony was part of the 59th annual Salute to Excellence ceremony, which honours Edmontonians who, according to Mayor Stephen Mandel, "bring layers of richness to our city through their remarkable dedication and talent. They enhance our reputation and make Edmonton a special place." But current U of A professor Greg Hollingshead was only one of eight appointed to the Hall of Fame earlier this month (June 7), during a ceremony at the Winspear Centre. In the same category as Hollingshead, award-winning playwright, director, and producer Stewart Lemoine was recognized, for not only his more than 60 plays, but for founding and operating Edmonton's Teatro La Quindicina theatre company (1982-2007). After leaving his post as Artistic Director, Lemoine entered into the Varscona Theatre as its resident playwright. The 5-time Elizabeth Sterling Haynes Award winner (1990's The Glittering Heart, 1993's The Book of Tobit, 1995's The Noon Witch, 1998's Pith, and 2006's At the Zenith of the Empire) has also credited himself as producer of Varscona's acclaimed Oh Susanna! production since 1999, and as director of the theatre's popular Die-Nasty improvised soap opera (1996-98). Lemoine, a native of Winnipeg, has also instructed both youth and adult students at both the University of Alberta and Grant MacEwan. In addition to his aforementioned accolades, Lemoine has been awarded the 1986 Dora Mavor Moore Award for The Vile Governess and Other Psychodramas, the 2003 Queen's Golden Jubilee Medal, the 2004 New York International Fringe's Award for Overall Excellence in Playwriting for Pith!, and the inaugural Tommy Banks Performing Arts Award in 2008. And now, he'll be immortalized in plaque form on the walls of the Citadel Theatre, where you can see all past inductees as well. Founding Chair of the Edmonton Concert Hall Foundation David C. Norwood, who just received a City Citation Award last November, was another Hall of Fame recipient. It was Norwood's chief vision that built the Francis Winspear Centre for Music in 1997. In a time when resources weren't exactly plentiful, Norwood rallied necessary interest and championed the concept of the Winspear Centre, and even went as far as clinching a record-setting, world-class organ to compliment the downtown venue. In addition to his work with the Winspear, Norwood has served on various local boards and committees, spent a term as President of Edmonton's Fringe Theatre Adventures, and was instrumental in the redevelopment of Old Strathcona's TransAlta Arts Barns, home of our city's legendary Fringe Fest. Norwood's also helped gap some of the distances between business, government, and the arts in the city of Edmonton. From 1965 to 1996 Robert Sinclair, our fourth inductee, has taught art at the University of Alberta, interrupted by--yet coinciding with--his time teaching at the Banff School of Fine Arts and the Red Deer College Summer Series Program. His own art has been exhibited around the world over the last four decades, and has lent merit to his establishing the Robert Sinclair Art Studio in 1989. 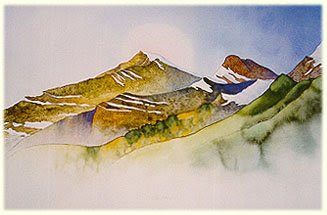 Best-known for his quirky watercolours, prevalent to indigenous scenery and landscapes (pictured left), vibrant flower blossoms, and subsiding roadways, Sinclair has maintained relevance in the local arts community for an impressive amount of time. The Saskatchewan-born, Manitoba-trained, Alberta-based arts advocate is also a proud member of both the Royal Academy of Arts and the Canadian Society of Painters in Watercolour, and now of the City of Edmonton Hall of Fame. Finally. This year's only Community Service inductee was Mr. Reza Nasseri, an unlikely philanthropist who arrived in Canada from Iran in 1964, with only $70 to his name. Now, the generous CEO of Landmark Group of Builders is signing million-dollar cheques to charity, and doing his part to lend communities opportunities (hey, that rhymes!). It was all those years ago, back in '64, that two visiting Edmontonians persuaded the Iranian tour guide to come to Canada instead of the U.S. when he made his move overseas. Once in Edmonton, Nasseri held various construction titles, from framer to plumber, before studying at the U of A and starting up his own construction company during 1977. The Landmark Group has since erected over 6,000 homes across the province. This has allowed the entrepreneur to donate about $1 million to both the University Hospital Foundation and NorQuest College. I once donated three bucks to the Ronald McDonald House, and some cans of beans to the Food Bank, so...kinda the same thing! The Sports chapter of the Hall of Fame welcomed three new honourees, including former Edmonton Eskimo Don Barry (pictured below right). The current Canmore resident got his football career started when he joined the team of Edmonton's St. Joseph's High School. But Barry had also kept active in junior hockey, as part of the Edmonton Waterloo Maple Leafs. In 1952, about a year after entering the Canadian Junior Football League, Barry signed on as an Edmonton Eskimo in the CFL. He stayed with the team for the next 10 years, switching from centre to guard to middle linebacker. 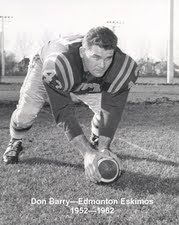 As an Eskimo, Barry went to the Grey Cup five times and won the championship three straight seasons (1954-56). When he retired from the League in 1962, Barry ventured into a whole new career, remaining on the coaching staff of the U of A Golden Bears for 13 years. Under his guidance, the Bears took home the Vanier Cup in 1967 and '72. In 2007 Barry was inducted into the Alberta Sports Hall of Fame as a member of the Edmonton Eskimos. A competitor even well into his eighties, swimming legend Jack Boddington first familiarized himself with the pool when he was in school back in England. He trained for years before Boddington was employed in water rescue when he was 22. From there he earned his first Bronze Medallion, in 1948, and went onto obtain a full suit of lifesaving proficiency skill awards. Boddington's also been honoured with the Royal Life Saving Society Commonwealth's highest award for volunteer service, even serving as the organization's Vice President. He's also the namesake of the Jack Boddington Award, recognizing significant volunteer service in the industry. It was instituted in 1970. And last, though certainly not least, is Mark E.R. Lund, an environmental conservationist, a published author (Mark's Guide for Alberta Paddlers, 2007), but predominantly an esteemed expert in paddling. Yes, paddling! As in canoes. And so there they are, the latest batch of deserving Hall of Famers who have spent decades blazing their respective trails for future generations. "These Edmontonians have touched the lives of people across Canada with their passion and leadership," insisted Douglas Barber, Chair of the Salute to Excellence Committee. "They are truly outstanding citizens who deserve to be saluted at such a hallmark event." For a complete list of past inductees click here. You can contact the Salute to Excellence Committee at 780-932-2615.